King High’s top status will be put to the test Friday at 5 p.m. when the Crusaders host East English Village in the Detroit Public School League Game of the Week. 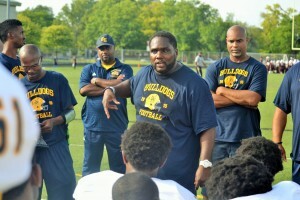 Much of the early-season attention has focused on King and two-time defending league champion Cass Tech, the Nos. 1 and 2 teams, respectively, in the Detroit News’ prep football state rankings. But East English Village cannot be overlooked. That much is clear after Coach Rod Oden’s Bulldogs won their PSL opener 40-7 last Friday at Renaissance, a week after dominating Walled Lake Central 56-20, also on the road, in their nonleague season opener. The Bulldogs’ dismantling of Renaissance was particularly impressive because the team they beat was coming off a 22-14 nonleague victory against Lansing Sexton, last year’s Division 4 state runners-up. King and Cass Tech also rose to 2-0 overall after winning their league openers. Coach Dale Harvel’s Crusaders erupted in the second half to beat visiting Western 42-0 and Coach Thomas Wilcher’s Technicians had an easy time in a 47-6 victory against visiting Cody. In other PSL openers last week, DCP-Northwestern (2-0 overall) won 45-0 against Osborn (1-1); Douglass (1-1) won 8-0 against Pershing (1-1); Central (1-1) kept CMA (0-2) winless 20-0; Mumford (1-1) beat Denby (1-1) 20-0; and Ford (1-1) defeated Southeastern (0-2) 36-12. King will be trying to stave off a third consecutive road victory by East English Village. A Crusaders’ victory would clear a big hurdle in their quest to win the league championship but a defeat would shake up things not only in the PSL, but would reverberate around the state. All other PSL games Friday are slated for a 4 p.m. kickoff. They include Mumford at Cass Tech; Denby at Renaissance; Cody vs. Western at Mumford High; Pershing at Southeastern; DCP-Northwestern at Central; Ford vs. CMA at DCP-Northwestern High; and Douglass at Osborn.